The so-called Social Media are booming these days. Its understandable seen the fact that they incorporate a whole array of social applications like MSN messenger and ICQ we used during the beginning of this century into one focal point with an easy-to-use interface. Nowadays they even have their “adult” counterparts like for example the XXXBlackbook. There is, however, a downside to companies like Facebook, LinkedIn and Xing. The companies that exploit these social media offer the service for free, so no payments are expected from its users. This obliges these companies to find ways to exploit the information of their users that they store on their servers. The costs of running an operation like Facebook.com are gigantic and at some point the investors want to see a return on their money. Next there is also a governmental interest in these networks. Governments like to spy on their citizens and social media are a great way to filter out individuals who do not agree with the establishment or who might support organizations and individuals that are considered dangerous or terrorist by the same government. It is known that the FBI has filters in Facebook that reports all profiles of individuals that use certain terms in their posts or in the links they feed to their account. Thirdly there are individuals who are interested in the profiles on these networks in order to steal identities and commit fraud. All these interested parties and agendas are usually not in the best interests of the users of such social media. Facebook exploits the data about individuals in their profiles commercially and sells these profiles to marketing companies who want to use this information for the confection of highly personalized advertising directed toward the same user. The FBI wants to know if you spread information that is not in the interest of Homeland Security or if you may be selling drugs and inventarizes the profiles of “suspicious” individuals. A company like Facebook.com can provide this information because it is centralized and they consider themselves owners of the information provided by their users. Once you put information into the profile of any social media, the cat is out of the bag. There is no way you can turn back the clock. Once it is on their servers, it becomes almost public information. Stuff you might have put on there and removed afterwards can still show up after years in the cache of search engines like Google or Yahoo. Thus, one should be careful with what one publishes on their Facebook profile, or any other social media, page. One has to take into regard that that information will reside in many more places than just the particular social network it was first published on. The good, however, news is that people are working on an alternative to the commercial social media. It will be called “Diaspora” and, as opposed to commercial social media, the information on this network will not be centralized. Diaspora is run on a network of connected servers, or “pods.” In fact, anybody will be able to have his or her own Diaspora server if that is desired. 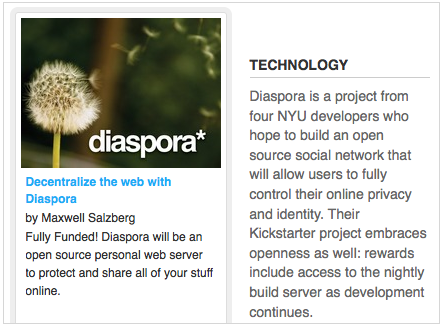 Diaspora works with so-called “Aspects” to which users can be subscribed. Ownership of all shared information and media is maintained by the person who publishes it and the owner has complete control of what is distributed and how. Profiles will be fairly limited to protect the same. I foresee a great advance in free press using this new social media. Localized independent news that will not be censored or monitored in any way can spread through this medium without commercial or government intervention, much in the spirit in which Internet was meant to be at the early beginning. In the beginning the Internet was to be what the users wanted it to be and not what commercialism and the government wants it to be like nowadays. In a nutshell, Diaspora will be what YOU want it to be and not what the (bad) men behind the curtain want it to be like is the case with Facebook, Xing and LinkedIn. I expect a lot of people who are fed up with the hidden intrusions into their privacy by the commercial social media to delete their profiles on the same and join Diaspora. I know I will for sure. I will be setting up my own “Pod” and as I advance in my knowledge about this fascinating new social media, I will keep you posted. To know more about programming and management of IT, I would like to invite you to our IT management Programs, where you will learn from the best European professionals. * All the content is responsibility of the author.